The Los Angeles Police Department and Mayor Eric Garcetti held a press conference Tuesday to address the murder of rapper Nipsey Hussle, who was shot and killed outside his store on Sunday. They also spoke about the recent surge of gang violence plaguing L.A.
Nipsey Hussle shooting suspect identified as Eric Holder, 29, of Los Angeles. The LAPD is asking the public’s help in locating him. LAPD Chief Michel R. Moore described a dispute between Holder and Hussle of a “personal nature,” and said Holder appeared in front of Hussle’s clothing store more than once before shooting him. LAPD Commissioner Steve Soboroff read a letter Hussle wrote to the LAPD prior to his death. Soboroff said a planned meeting between the LAPD, members of Nipsey Hussle’s family and his label Roc Nation will continue as scheduled. Before his death, the rapper planned to meet with police officials to discuss ways to fight gang violence in the city. During the press conference, LAPD Chief Michael R. Moore talked about the suspect in the murder of rapper Nipsey Hussle. He has been identified as 29-year-old Eric Holder, and he is not in custody. Moore then addressed Holder directly: “To Mr. Holder, who I am confident is watching this, I ask him to surrender,” Moore said. The LAPD chief said there was a dispute between Holder and Hussle of a “personal nature,” and that Holder appeared in front of Hussle’s clothing store more than once before shooting him. “We believe this to be a dispute between Mr. Hustle and Mr. Holder. It appears to be a personal matter between the two of them,” he said. During the press conference, Los Angeles police officials spoke about ways they are seeking to address gun violence. The Los Angeles Police Department said they will establish an office of violence prevention to tackle gun violence and help with support for the families of victims of homicide. “The issue of gun violence cannot be minimized,” a spokesperson for the department said. During the press conference, LAPD Commissioner Steve Soboroff read a letter Nipsey Hussle wrote to the LAPD prior to his death. Soboroff said a planned meeting between the LAPD and Nipsey Hussle’s label Roc Nation and members of Hussle’s family will continue as scheduled. The rapper planned to meet with Los Angeles Police Department officials to discuss ways to fight gang violence in the city. Los Angeles Councilmember Marqueece Harris-Dawson spoke at the Nipsey Hussle press conference and quoted the rapper’s lyrics in his address to the press. Garcetti called Hussle “a tireless advocate of the people of this city and this world,” and said, “His impact on our city was deep.” Garcetti addressed gang violence, as well, in his remarks, and said even though homicide rates are down 17 percent in Los Angeles in the last year, there have been 11 homicides across the city in the past week alone. 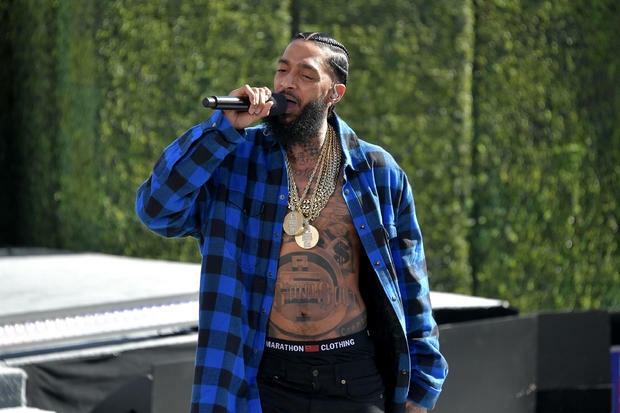 A suspect has been named in the investigation into the murder of rapper Nipsey Hussle. Eric Holder, 29, of Los Angeles, is identified as the suspect. The LAPD is asking the public’s help in locating him. Detectives say that Holder was last seen in a 2016 white four-door Chevy Cruze with California license plate 7RJD742. Anyone with information on the shooting is asked to call South Bureau Homicide at 323-786-5100. Several people were injured Monday night when some 300 who’d gathered outside Nipsey Hussle’s clothing store in South Los Angeles to pay their respects to the slain rapper suddenly stampeded from the area, authorities said. A spokesperson for the Los Angeles Police Department, Meghan Aguilar, told reporters there was “mass panic and chaos.” There was no initial word on what set it off. Community leaders and fans lead an outpouring of support for Nipsey Hussle. African American leaders in Los Angeles have demanded the person who killed Nipsey Hussle turn himself in and surrender to police. Hussle’s devastated fans came to the crime scene Monday to leave tokens of support and remembrance. Basketball stars Lebron James and Russell Westbrook each tweeted messages of grief following the news that Hussle had passed away. Nipsey Hussle performs onstage at Live! Red! Ready! Pre-Show, sponsored by Nissan, at the 2018 BET Awards at Microsoft Theater on June 24, 2018, in Los Angeles, Calif.
Nipsey Hussle, the Grammy-nominated West Coast rapper known for his community outreach in South Los Angeles, was shot and killed outside his clothing store on Sunday, the city’s mayor confirmed. He was 33. Hussle, whose real name was Ermias Joseph Asghedom, was shot to death in front of Marathon Clothing, the store he founded in 2017. Two other men were hit in the shooting but their wounds weren’t considered life-threatening. An autopsy performed Monday determined Asghedom was shot in the head and torso, according to the Los Angeles County Department of Medical Examiner-Coroner. His death was ruled a homicide, officials said. The Grammy-nominated rapper was being remembered not just for his music but for his deep community involvement and activism. A photo of rapper Nipsey Hussle, 33, is seen among candles as people gather to mourn him April 1, 2019, in Los Angeles, Calif.